Catch up with your puppies as they get ready for some summer fun. 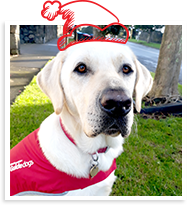 It’s doggie treats all round – Yates has officially qualified as a guide dog after rigorous training and testing! 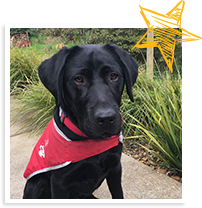 The team at Guide Dogs are now working to find him the perfect match. 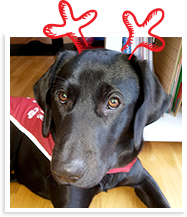 Yates will be a wonderful guide dog for the right person, but that special someone will have to have a personality and lifestyle that matches Yates’s personality and skills. We’ll let you know when he finds his perfect human. Pia continues to walk confidently on her lead. She has also been to the ballet, which she enjoyed very much. But there’s nothing she likes more than playing with her family. Sometimes she even walks to the local school where her puppy raiser talks to kids about what it’s like to raise a guide dog puppy. If there’s water around, Rita will find it – she just loves to swim! She’s also been busy visiting cafes and restaurants and is now very good at going to the supermarket. 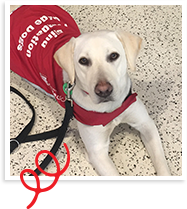 Rita also loves to meet new people, which she got to do at two recent guide dog fundraisers. They loved you too, Rita! A puppy needs to be 100% fit and healthy to become a guide dog. Sadly for Harris, he developed health condition and had to be withdrawn from the program. But this is still a good news story, because Harris will still go on to change someone’s life and become their best friend – just in a different way.